← ALIENS GET THE SNIFFLES TOO! A TWO PART book. 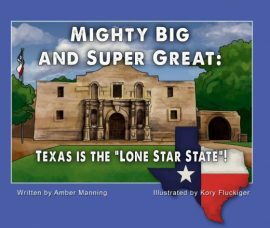 The first part is a rhyming and witty story that touches on some of the history of Texas while also introducing the importance, meaning and symbols that are relevant in our state. The second part includes 28 fun Texas facts mixed with more knowledge of fundmantal elements such as the Texas pledge and our state song.